The entire Geolandar H/T-S line has been designed to effectively address the demands of day-to-day driving. 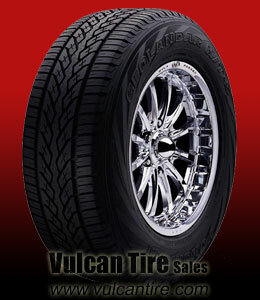 All-season durability, comfort and handling are key benefits of this tire. The Geolandar H/T-S Inch-Up sizes offer attention-grabbing looks and a high-performance feel with the practicality of a daily driver. Yokohama�s proprietary tread compound promotes longer wear and more mileage, while maximizing wet traction. Cross grooves provide more biting edges for enhanced traction on snow and ice. Constant contact tread block design reduces the noise created by air moving through the tire grooves. Full jointless nylon cap ply and edge covers increase durability, handling and wear of this H-speed rated tire. Unidirectional tread design delivers outstanding steering response, grip, cornering and water evacuation.High-performance casing profile delivers quick steering response while retaining ride comfort. Inch-Up sizes feature a unique sidewall to complement the sporty image of your SUV or truck.